Destincomforts.com Destin Vacation Rental home near the beach. 5 Bedrooms, 4 Baths with 2 living rooms, 2 master suites and 2 wet bars!!!! 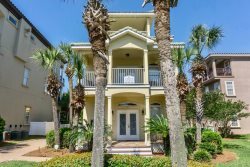 Tiger Bait is the name of this beautiful, well appointed home in the Villages of Crystal Beach. This is a gated community and this home overlooks the fabulous Lagoon style pool with waterfalls, Hot Tub, Tiki Chilling area and surround sound system. Seasonally Beach Trolley will transport you to the nearby sparkling waters of the Emerald Coast. Centrally located in Destin so close to shopping, movies and Restaurants right at Destin Commons.... you can walk there! Enjoy everything Destin has to offer just minutes away. This amazing home has 5 bedrooms, 2 master suites, 2 wet bars, and 2 large living rooms! Living room with TV, DVD, IPod player, Kitchen, Dining, Large Utility room, Full bathroom and large King Bedroom with Plasma TV and large closet. Master suite #1 has a King bed, Sofa sleeper, Plasma TV, Wet bar with refrigerator and microwave. Walk out to the large Porch lots of Comfy furniture overlooking the pool. Master bath has large corner Jacuzzi tub, Shower, 2 vanities and huge walk in closet. Master suite #2 has a King bed with Plasma TV and a full bath. Third Floor has Large living room with Plasma TV, sofa sleeper, futon, and Wet bar. Walk out to large porch overlooking the Pool. Bedroom #4 has a Full Over Full Bunk, walk in closet and adjacent bathroom. Bedroom #5 has a King bed. Book on line with no security deposit. Second Floor with 2 Master Suites. Master #1 with King bed, Plasma TV, wet Bar, sofa sleeper and walk out porch overlooking the pool. Bath has Jacuzzi tub, shower, 2 vanities and huge walk in closet. Third floor has Living room with sofa sleeper, futon, wet bar, Plasma TV and walk out to porch overlooking the pool. Bedroom #4 Has 2 full size beds with attached bath. Bedroom #5 has King bed. I've never had a better experience than working with these members. Destin Comforts is most friendly . Helps you in your rental needs and have awesome rates.